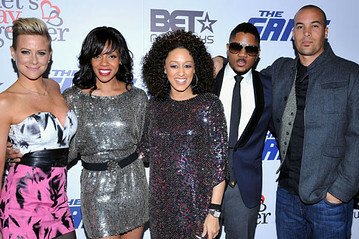 The season finale of 'The Game' drew in some very respectable numbers for BET. Much higher than the 1.8 million viewers the show averaged in it's final season on the CW, the finale closed with 4.4 million viewers. It is fair to note however that the show did premiere with a whopping 7.7 million viewers. First, the messy part: The episode picked up with Tasha back in her role as Malik's agent. After setting up a viral video shoot where Malik declares he will bring the Sabers another championship, she runs into Beau, the man with whom she had a fling in the last episode. Tasha thinks it's destiny, but it's an unfortunate coincidence. Beau faked his illness and actually has a whole family, which is revealed to Tasha when his children run up to him and his wife calls him by his apparent real name, Ronnie. The well-done part: Derwin and Melanie's pregnancy woes take a temporary backseat to a new dilemma. With Tasha working with Malik again, Derwin no longer feels comfortable with Tasha as his agent, but instead of telling her himself, he tells Melanie to deliver the news to Tasha. It's a weak move by Derwin, but one we've come to expect from someone. For whatever reason, he has always been averse to hurting people directly to their face. Melanie invites Tasha over for the talk. When Tasha asks Melanie if she will give feedback on her plan to resurrect Malik's career, Melanie says, "Definitely." It's an important word. Every time Melanie says "definitely," Tasha explains, "that means something's going on." Melanie tries to shrug the allegation off, but she's visibly uncomfortable and forced to be forthright about Derwin's issue with representing both he and Malik. The results are disastrous. Melanie refers to Malik as Tasha's "druggy son" and Tasha throws licorice at Melanie. As for Malik, his downward spiral is going even further downward. He foolishly sets up a fake photo shoot for Jenna, his aspiring model ex-girlfriend, just so he could see her. When he tells her he set the whole thing up, he says it with an air of confidence, as though it was actually nice of him to set up a fake photo shoot for a woman who is trying to piece together the model career she had before she went into rehab. Of course, Jenna walks off, and later shows up at Malik's front door back on the wagon. Meanwhile, behind his back, Derwin and Jason recruit Quan Kirkland to take Malik's place as the starting quarterback for the Sabers, setting up what is sure to be one of the biggest fictional first-string quarterback battles in television history should the show return next season. In another twist, at the press conference announcing Kirkland's signing, Jason sees his former lover Camille (Stacey Dash) in attendance. Jason and Camille were one of the most compelling relationships at the conclusion of last season, and the two arguably had more chemistry than Jason did with his ex-wife Kelly. When Camille sees Jason, she invites him out to dinner later in the evening, leaving Jason under the impression she wants to rekindle their romance, until she walks away and right into Kirkland's arms to kiss him. Quan Kirkland, the man who idolized Jason Pitts is not only the Saber's new quarterback who can help Derwin break all of Jason's records, Kirkland is also helping Camille break Jason's heart. With Malik potentially out of the picture, and Tasha out with him, the show's shining couple — Derwin and Melanie — close out the season finale with the kind of twist we have come to expect. Derwin and Melanie visit a fertility clinic to figure out why Melanie is having trouble getting pregnant. The doctor asks Melanie a list of questions, all of which would help him gauge her ability to get pregnant. One of the questions: Have you ever had an abortion? Melanie's answer "Definitely not." Tasha isn't the only one who knows what it means when Melanie says "Definitely." When the doctor leaves to place an order to draw some blood, Derwin asks her, "The abortion…was it mine?" With that, season four of "The Game" is over. So, did you watch the season finale of 'The Game'? And if so, what did you think?